Tortelli with basil and pecorino in a Sicilian red prawn sauce; sea bream with cherry tomatoes and a basket of steamed vegetables; cannolo, cassata and "seven veils" ice cream; ice cream and brioche for breakfast - these were just some of the sumptuous Sicilian dishes enjoyed by the G7 leaders, their first ladies and the first husband at Taormina last week. At the same time, a MSF ship carrying 1,446 migrants who had been saved from 12 inadequate boats in the Mediterranean was not permitted to dock in any Sicilian port because of security measures in place from 22nd - 28th May for the summit. This meant that the ship was at sea for 48 instead of 30 hours and ran out of food and water. As the situation became truly desperate and a hygiene emergency developed on board as a consequence, the ship was allowed to pick up supplies at Palermo but no one was able to disembark. The ship finally docked at Naples on 28th May. Paragraphs 24 and 25 of the G7 comuniqué make interesting reading, as while all this was going on in the very sea that served as a backdrop for the leaders' jolly photos, they promised to uphold "the human rights of all migrants and refugees." It is worth remembering that this meeting took place two days after 34 people had died in the Mediterranean, including seven children. The leaders have returned to their homes now, but there is no end to the scenes of devastation for those who have no home: Yesterday 252 migrants were brought to Pozzallo. 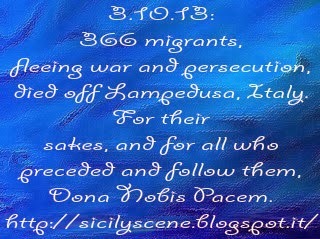 Of these, 135 had been on an overcrowded migrant dinghy which had sailed from Libya. The middle section of the boat began to break up and 25 migrants fell into the sea. Two were rescued but sadly died later. One people trafficker has been arrested by Italian police in connection with the tragedy and a second alleged trafficker from another boat is in hospital. All the survivors are said to be in reasonable conditions of health and are being transferred to reception centres in other parts of Italy. 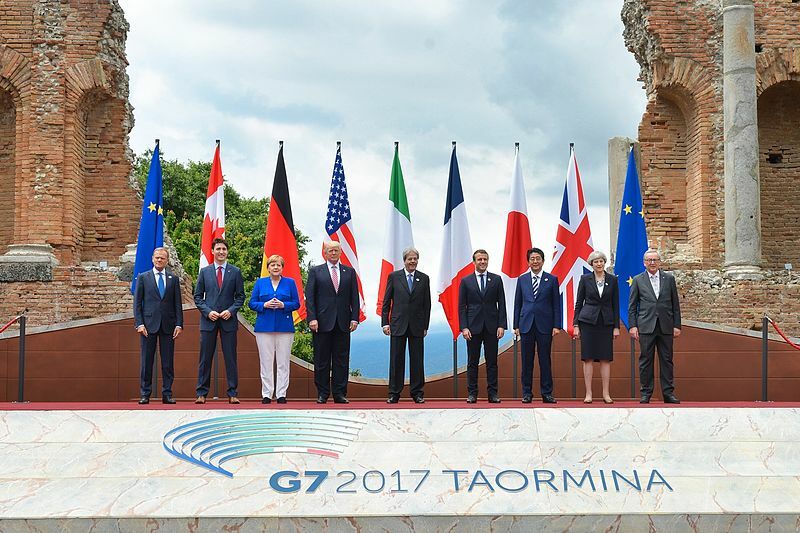 Some good, it is to be hoped, came out of the G7 and of course Italy had to put on its best show. The leaders were filmed strolling through the streets of a Taormina that had been cleared of all except residents and security personnel and they even visited a few shops. None of them, to my knowledge, visited a migrant centre. La Repubblica reports today that 1,720 migrants have drowned in the Central Mediterranean this year and that 60,000 have attempted the crossing. Last week alone the Italian Coast Guard and other operatives saved 9,500 migrants in the Mediterranean.